Soft texture glides on smoothly and blends evenly for a natural sheer finish. This long-lasting powder gives you a natural looking colour for up to six hours. Comfortable formula. Streak and smudge resistant. Rimmel blush make me feel absolutely confident, my skin doesn’t shine. I used to swear by any Rimmel product. When I first started experimenting with make-up, I would literally make one stop at the Rimmel counter and get foundation, powder and blush. Now, a few years ahead, and I have learned that I can mix and match with my make-up brands. However, the Rimmel blush is the only product that I have never changed! It has the perfect amount of pigment to last you the whole day, but yet it doesn’t stand out so much that you look like a clown! It is also very cost effective, as I can go several months without having to replace it. Being a girl who gets bored easily, I usually change products on monthly basis, but the Rimmel blush I have been using for about 3 years without a break. I am happy to say that I will continue using this product! 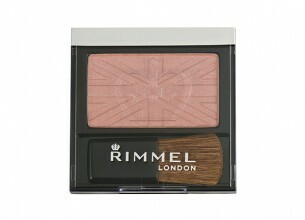 Rimmel has always provided solid, reliable products and it’s no different with this blush. Available in six different shades, it comes with a small blush brush for those who might not have one. The brush itself is soft and will create a nice glow on your cheek, but make sure to blend it in thoroughly, as it can create a distinctive line if you only swipe it on. I used Mauve Cool – a great colour for autumn. Best of all, you can decide whether to go a little darker to give your cheeks extra warmth or keep it to a minimum with just a touch of colour. Normally, I’m quite skeptic when they use words like ‘long-lasting’, but in this case it was actually true. Pair it with a light highlighter to define your cheekbones and you’ll be the envy of your friends.